Mass events drain me. I am an introvert. 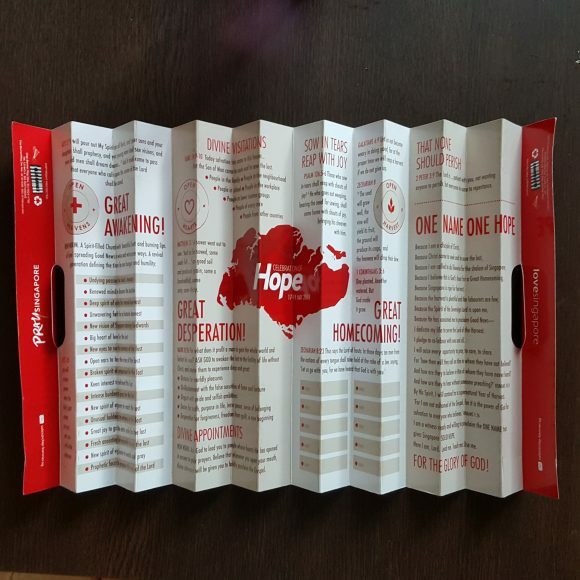 So when 7 October 2018 – Pray Singapore was publicised by Love Singapore, I must admit I was hesitant to sign up because after preaching on a Sunday morning, I would not want to spend another three afternoon hours in the National Stadium, fighting heat, tiredness and jostling with crowds of people. However, in the end, I got out of my comfort zone and signed up for prayer with the Body of Christ in Singapore. Here are some of my off the cuff thoughts. For a start the build up was exciting. Going there early, walking with the lines of people walking from Kallang MRT to the Stadium; and seeing the build up of the people filling the Stadium. 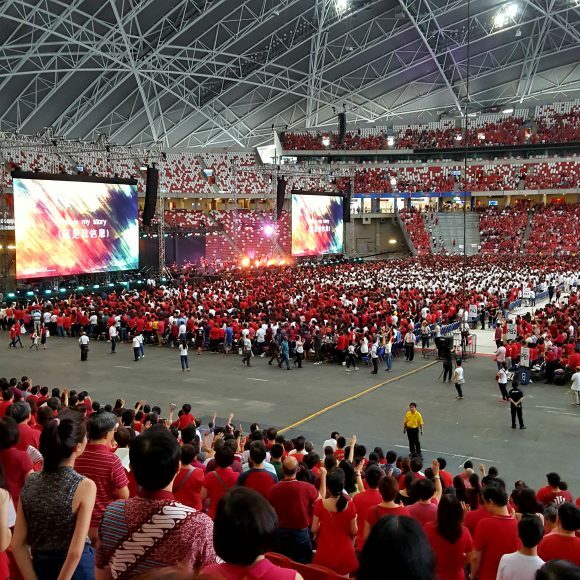 It highlighted the great organisational skills needed to get this event on its ground, and the mobilisation grace to fill the Stadium with 40,000 to 50,000 believers. The Love Singapore leaders are great tribal leaders! I liked seeing the people of various age groups. I liked the clever clap-banner they gave everyone. When you used it to clap it amplified the volume 20 times. We should issue these clap banners in every church for use in worship services! I liked the good balance and build up of prayer themes. I liked the variety: different kinds of prayers (set liturgical prayers, spontaneous prayers, group of twos and threes praying, prophetic declarations and acts, everyone praying in unison); different leaders from different denominations both young and old ( besides giving honour where it is due some political correctness was involved here); the use of Mandarin, Tamil besides the main language of English; the different groups (marrieds, families, children, younger pastors, veteran pastors); different prayer themes (Church, Family, Nation, Harvest). I liked the five minute talks giving statistics, telling stories, challenging and inspiring the prayer themes before we prayed. 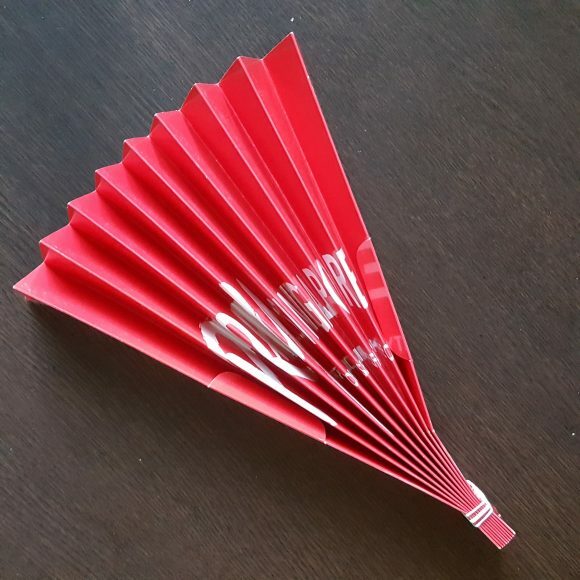 Gift pack included a clap banner that made a lot of clapping sound, and a lot of sense because it also was usable fan. A lot of time was spent praying for the FAMILY theme so that by the time we reached praying for the HARVEST it was anticlimactic. This goes to show how much urgency ad importance the organisers placed on the foundation and future of our nation: strong families. On the whole I surprising left the Stadium energised not with physical or emotional energy but a supernatural charge. If they could check the charge it would be like the mobile battery icon fully charged. I was so glad my colleague Tom Cannon mobilised scores of young and older church members to participate in this event. When I attended Arsenal’s football game recently, I left about 5-10 minutes before the end because I simply hated jostling with the crowds. This time I stayed to the end, and they that endure to the end shall be saved, but caught in a multitude of red shirted people all trying to get into the Stadium MRT. Nevertheless I rejoiced in God my Saviour.